The late 1970s were a busy time for bassist James Jamerson, Jr. and the late guitarist David Williams. In addition to being in heavy demand as session players, Jamerson and Williams came together as the soul/funk/disco duo Chanson (a name that came from the French word for “song”). Chanson didn’t last long: they only recorded two albums—1978’s self-titled Chanson and 1979’s Together We Stand, both originally released by Ariola Records—before breaking up. But Chanson enjoyed one major hit: the danceable, Chic-influenced 1978 single, “Don’t Hold Back,” which reached #8 on Billboard’s R&B singles chart and #21 on the Billboard Hot 100. Because of “Don’t Hold Back”’s Chic influence and disco-funk appeal, Chanson were often described as a disco act. But Chanson is diverse. 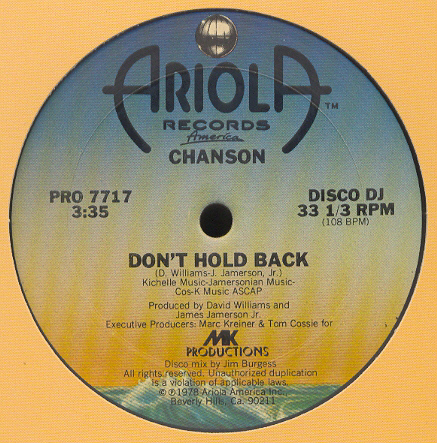 While “Don’t Hold Back” and the infectious single “I Can Tell” (a minor hit featuring singer Linda Evans) are clearly disco-minded, the approach on “Did You Ever,” “I Love You More,” “All the Time You Need” and “Why” sounds more like a combination of Detroit soul and Earth, Wind & Fire. FunkyTownGrooves’ expanded 2014 edition of Chanson offers the 7” single versions of “Don’t Hold Back,” “I Can Tell,” “Did You Ever” and “All the Time You Need” as bonus tracks. That strong Motor City influence is not surprising in light of Jamerson’s background. Although Jamerson and Williams (a native of Newport News, Virginia) were based in Los Angeles when this album was recorded, Jamerson grew up in Detroit—and his father was the iconic bassist James Jamerson, Sr., who played on countless sessions for Motown Records in the 1960s and influenced a long list of electric bassists ranging from Larry Graham to the Brothers Johnson’s Louis Johnson to the late jazz-rock fusion master Jaco Pastorius. Indeed, James Jamerson, Jr. (whose father died in 1983) learned from the best. An impressive cast of players join Williams and Jamerson, Jr. on this album, including trombonist George Bohanon and trumpeter Oscar Brashear (both of whom had been part of a great but underexposed funk/jazz band called Karma). Members of the pop-rock outfit Toto (Steve Porcaro and David Paich on keyboards or synthesizers, the late Jeff Porcaro on drums) are also on board, and five of the participants have an Earth, Wind & Fire connection: guitarist Al McKay, trumpeters Rahmlee Michael Davis and Michael Harris, saxophonist Donald Myrick and trombonist Louis Satterfield. Collectively, Davis, Harris, Myrick and Satterfield came to be called the Phenix Horns, a name they acquired during their years with EWF. A vital contributor to Chanson is Los Angeles-based arranger/producer Benjamin F. Wright, Jr., who has played with everyone from Aretha Franklin to the King of Pop Michael Jackson over the years and handled all of the arrangements on both this album and Together We Stand. Wright had worked with Williams and Jamerson, Jr. extensively before Chanson came about, and his skillful arranging is an essential part of both albums. Two of the Phenix Horns are no longer living. Myrick was 53 when he was shot and killed during a botched narcotics investigation in L.A. in 1993 (another senseless fatality in the U.S.’ failed War on Drugs). And in 2004, Satterfield died at the age of 67. But Davis and Harris are alive and well and still playing a variety of music. One could spend hours talking about all the famous musicians who employed Jamerson or Williams on their sessions back in the day. But the two of them obviously wanted a chance to show what they could accomplish as leaders of their own group, and with the release of this album in 1978, they did exactly that. Alex Henderson’s work has appeared in Billboard, Spin, Salon.com, Creem, The L.A. Weekly, AlterNet, JazzTimes, Jazziz, Cash Box, HITS, CD Review, Skin Two, Black Beat, The Pasadena Weekly, Black Radio Exclusive (BRE), Music Connection, Latin Style, The New York City Jazz Record, Jazz Inside Magazine and many other well-known publications. Henderson (alexvhenderson.com) also contributed several thousand CD reviews to the popular Allmusic.com website and The All Music Guide’s series of music reference books.